"Meiyo shinbun" becomes "Meiyo shindan" | "bun" replaced with "dan"
Linguistic note In the following article, as elsewhere on this website, 錦絵 and 錦画 are differentiated in romanization as "nishikie" and "nishikiga" -- though both are read "nishikie". 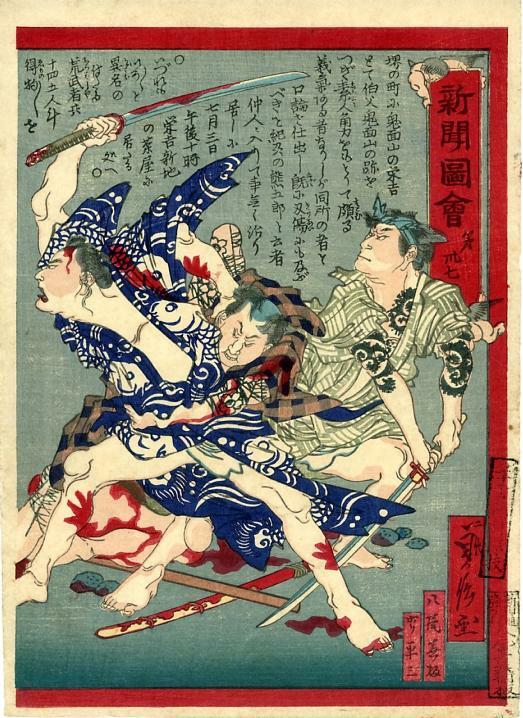 One of the most intriguing issues concerning the rise and demise of Osaka news nishikie is the treatment of the word "shinbun" on blocks and prints. 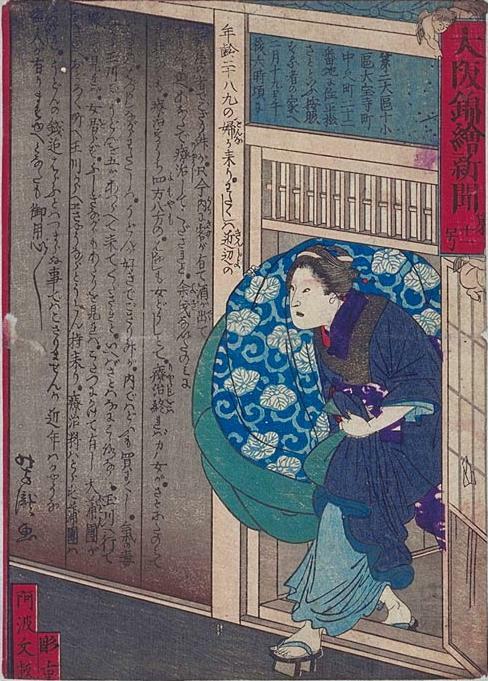 I had seen an occasional print with "shinbun" replaced or brushed out, in exhibition catalogs, in on-line image databases, as well as on Tsuchiya 2000 (Bunsei Shoin CD-ROM). However, I was not moved to try and impute meanings to such defacements until September 2005, when I bought a group of prints most of which showed various forms of what I have come to call "shinbun" suppression. 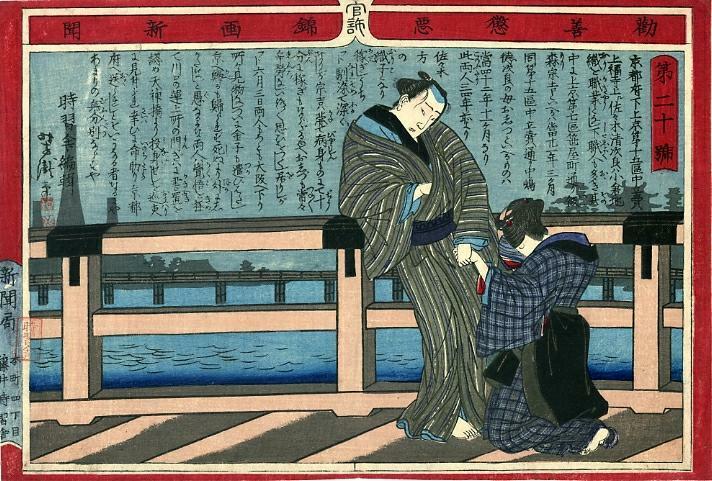 Of 14 prints an Akita dealer offered in an on-line auction, 13 had overprinting in the form of names and addresses stamped on the borders and/or margins, and/or on the image area. 12 prints also showed evidence of "shinbun" suppression, either by brushing out "shinbun" (or just "bun") with vermillion or black pigment after printing, removing "shinbun" from the block before printing, or in one case pasting "wa" over "bun" after printing. Of the 12 prints I was able to buy, 11 had been altered these ways, and I saved images of the other two prints, one of which had been altered. Only one print, among the two I did not acquire, had neither alterations or overprinting. As will become clear when we look at changes in printed matter regulations in Osaka, the purpose of the overprinting was to disclose the full legal names of the writers/drawers and publishers, in order to identify the people behind the nom de plumes and publisher handles on the prints, so that they can be held more responsible for their publications. The purpose of the "shinbun" suppression is not as clear. It is my contention that, about the same time the overprinting began, most news nishikie publishers in Osaka were no longer allowed to represent their products as "shinbun", and therefore had to alter the word on prints already made and on future reprints. That they did so, in many ways, is clear from the numerous examples I have shown below. Half of the prints in the lot I bought had also been torn at one time into three or four parts, which someone had put back together by pasting onto a backing sheet. This had been done a long time ago. Apparently someone destroyed the prints then had second thoughts. Or someone else rescued the pieces. Obviously the prints are not in what would be called good condition. But as examples of "shinbun" suppression and overprinting they are priceless. 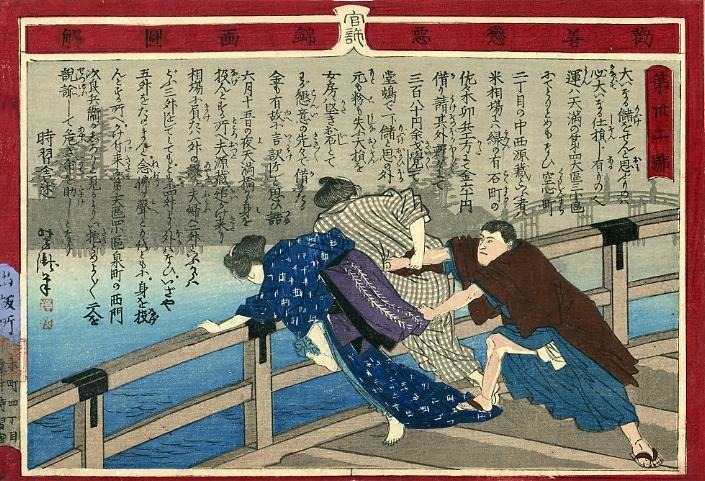 According to the seller, the prints had been part of a fairly large collection of nishikie from Morioka. The purchase of these prints started me wondering who had gone to such lengths to suppress "shinbun" from them and why. I searched through my own collection of exhibition catalogs, on-line print collections, and images on Tsuchiya 2000 for other examples. All examples I was able to find are listed in the table at the end of this article, and most are shown in the table of examples following this introduction. 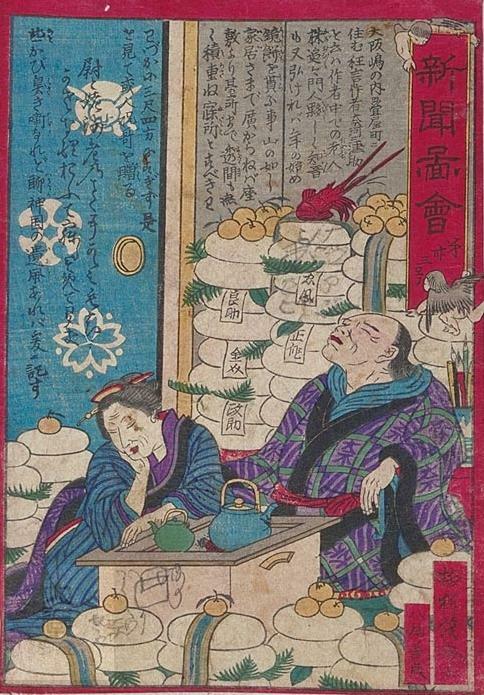 Practically all early Osaka print series were subject to some form of "shinbun" suppression. All larger institutional collections have examples of such suppression. The overprinting was done by the publishers themselves. They probably did all of the "shinbun" suppression as well, though sellers could have brushed out graphs. 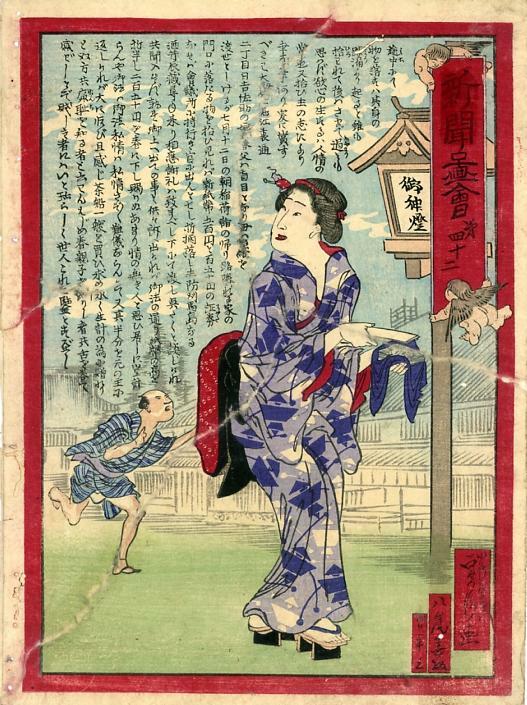 Practically all the Osaka print series appear to have begun around spring 1875 and ended by late summer or early fall. Kanzen choaku nishikiga shinbun / zukai (KCNgS/Z), the longest running of the earlier Osaka series (Series 13 in Tsuchiya 2000), seems to have started sometime during the summer and run well into fall after the other early series had stopped. More about the chronology of the series below. KCNgS/Z was unique in that, unlike other earlier series, which show the publisher's handle in a cartouche on the print, it shows the name of the publishing company above the address and name of the publisher -- in a colored cartouche carved on the otherwise vermillion border. The name of the company was Shinbunkyoku [News bureau], the address was Honcho 4-chome, and the publisher's name was Fujii Jishusha. 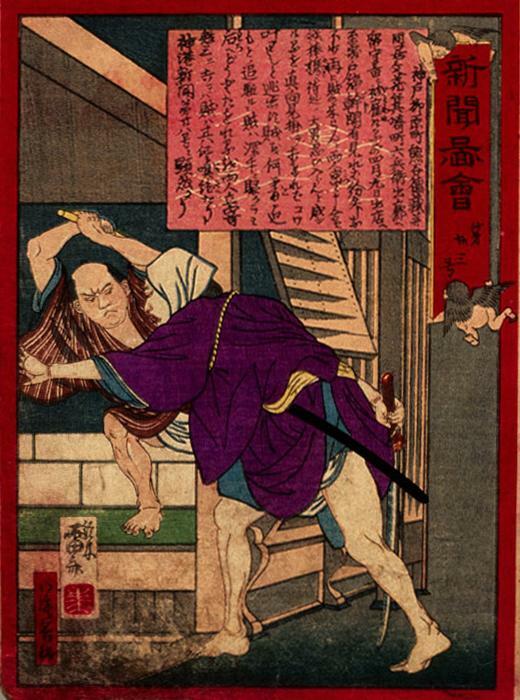 Jishusha was the handle of Fujii Katsuzo, a shizoku (former samurai) employed by a government-subsidized Osaka publishing company whose name has not been found in records. Fujii also signed the articles as compiler and editor. Since the masthead of the nishikie included the graphs "kankyo" (官許) or "government approved", the KCNgS nishikie series was apparently a publication of the officially recognized publishing company. Tsuchiya regards as "deeply interesting" the fact that "the [nameless] publishing company, which had been publishing Osaka shinbun until April 1875, was involved with a nishikie shinbun" (Tsuchiya 1995:46-48, 2000:24). That KCNgS's former-samurai publisher had until recently been the publicity manager for a defunct news magazine probably explains the pretense of calling the nishikie a "shinbun" and publishing it under the auspices of a "Shinbunkyoku". The Kanzen choaku nishikiga shinbun guise continued through issue No. 37. From No. 38, the title became Kanzen choaku nishikiga zukai and the name of the company publishing changed to Shuppanjo [Publishing office]. In other words, "shinbun" dissappeared from both the title of the nishikie series and the name of the company. However, the new "corporate ID" didn't work, for the series ended with No. 48. Fujii Jishusha actually began signing his articles as "Henshu [compiling and editing] Fujii Katsuzo" from No. 37, the issue before the changes in the title and company. All three changes suggest an effort to conform new regulations concerning (1) disclosure of actual names rather than handles, and (2) avoidance and suppression of "shinbun" in titles of nishikie series that had been presenting themselves as "news". More interesting than Fujii's connections with journalism is the fact that the suppression of "shinbun" from KCNgS was retroactive. 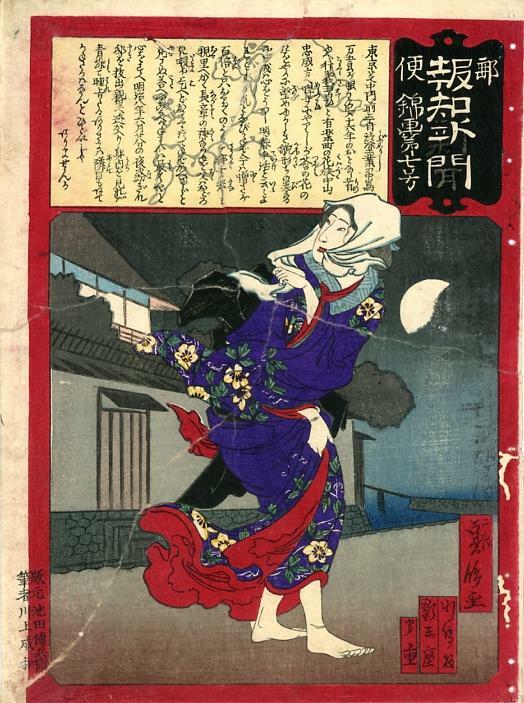 Prints with the older title and company name -- whether copies already printed or reprints later made from the original blocks -- were mannually corrected to read "zukai" instead of "shinbun" in the title, and "Shuppanjo" in place of "Shinbunkyoku" in the publisher's cartouche. Dating the change from "shinbun" to "zukai"
When exactly did this title change take place? Here is a breakdown of dates that appear in, or are otherwise associated with, KCNgS/Z stories. 24 25 January last year Father dies on Yashichi (a New Year's festival?). Articles attributed to Jishusha through No. 36. 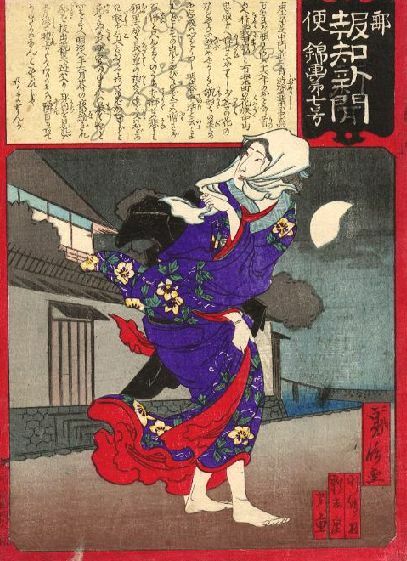 Articles attributed to Fujii Katsuzo (Jishusha) from No. 37. KCNg shinbun and Shinbunkyoku through No. 37. 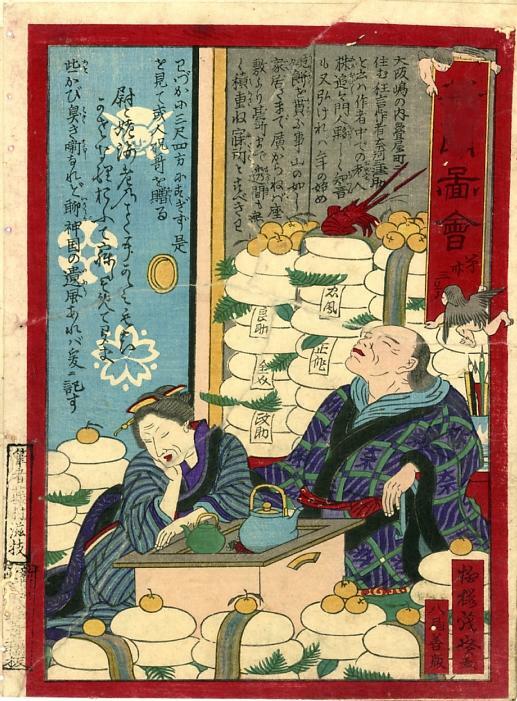 KCNg zukai and Shuppanjo from No. 38. Only issue with source attribution. 1. Some of the dates are preceded by "saru" (去る), "to" (当), and "kono" (此). Their respective meanings -- "this recent / past", "this present / current", and "this" -- are more-or-less synonymous. Most of the dates refer to the incident in the story. A few bracket the beginning, and a few the end, of a story that develops over several weeks or months. 2. The association of Hochi No. 33 (27 July 1875) with KCHgS No. 37 is based on Tsuchiya 2000:21 and means only that the same Kinseimaru story appeared in this Tokyo paper six days after the steamship sank. 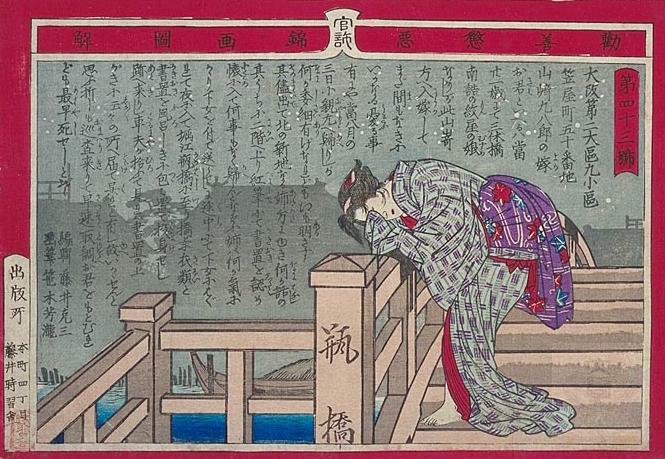 Since it sank in the Japan Sea, news of its sinking would probably have reached Osaka before Tokyo. From our analysis of the lag between story date and estimated publication date for Tokyo news nishikie (see TNS Souvenirs to News and YHS Seals and Toshimitsu under Articles), and from looking at the scattering of dates associated with ONgS (see ONgS Variations (112) under Articles), we can expect the wild variation of lag times evident in the distribution of dates by issue number in the above table. However, there is a clear tendency for later issues to convey later stories, and for later issues to focus on July and August stories. While some issues undoubtedly came out in a more timely manner, others clearly reached back in time to report stories that were not timely but simply interesting. Perhaps the stories were only recently discovered. Or perhaps they had been discovered earlier and were being saved for future issues. The kinds of stories, and the way they were told, suggest that the series was primarily intended to fulfill the expectations created by its "kanzen choaku" [encourage good and chastise evil] title. Indeed, many stories were of the human interest sort whose morally didactic messages were timeless and therefore they did not need precise datelines. This pandering to expectations of moral instruction made Osaka news nishikie, despite their "news" pretensions, essentially curios like their Tokyo cousins. In any event, if we allow two weeks to one month average lag time between story and issue, it would seem that the cline between the "shinbun" and "zukai" changeover came sometime during August. The "during August" estimate makes perfect sense in terms of the following regulatory developments in Osaka prefecture. Note 1 -- The following information, except as noted, is based on Tsuchiya 1995:52-53. Tsuchiya digested the information from Hara Hidenari 1990 (see Bibliography). Hence the information will be modified at which time I am able to examine Hara's work directly. Note 2 -- The May 18 and May 29 Hochi articles are included here to show what kind of attention Osaka and Tokyo news nishikie were getting at this time. The Hochi, while a Tokyo paper, was imported in Osaka. The negative attention in the May 29 article would seem to echo the concerns that provoke regulation. May 18, 1875 -- Article in No. 671 edition of Yubin hochi shinbun digests the double suicide story reported in Osaka nishikiga shinbun No. 8 and describes the nishikie itself (Tsuchiya 1995:36; Tsuchiya 2000). 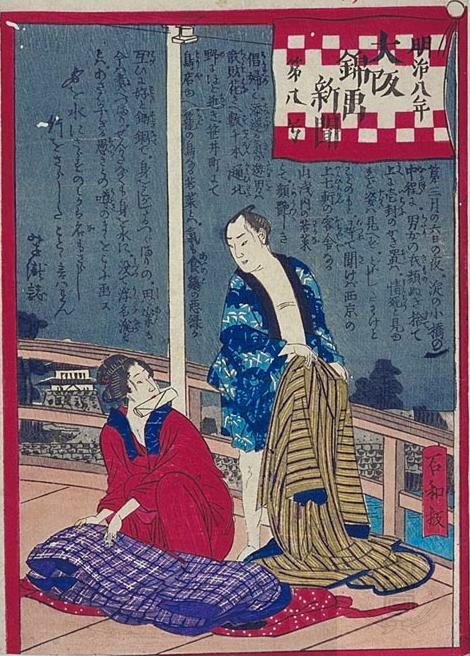 May 19, 1875 -- Distributor receives order from Osaka prefectural government to stop selling news nishikie that have not been registered and received permission to publish (Tsuchiya 1995:52). 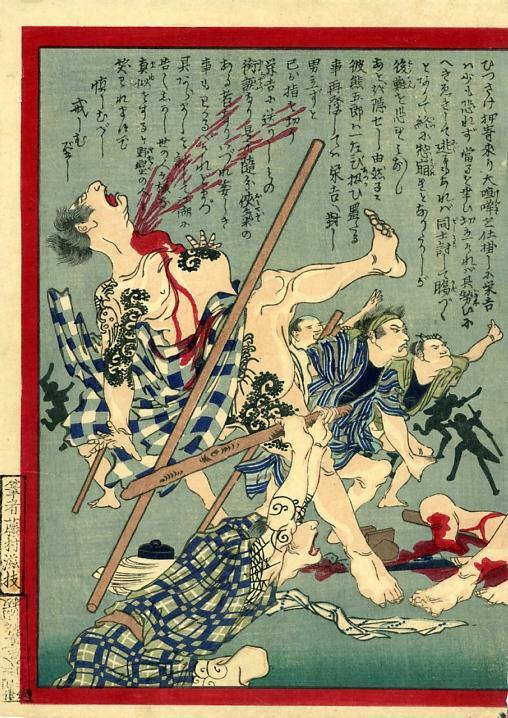 May 29, 1875 -- Article in Yubin hochi shinbun criticizes exaggerations and falsehoods reported in both Tokyo and Osaka news nishikie, and claims that the nishikie damage the image of "real newspapers" (Ibid., 36-37). 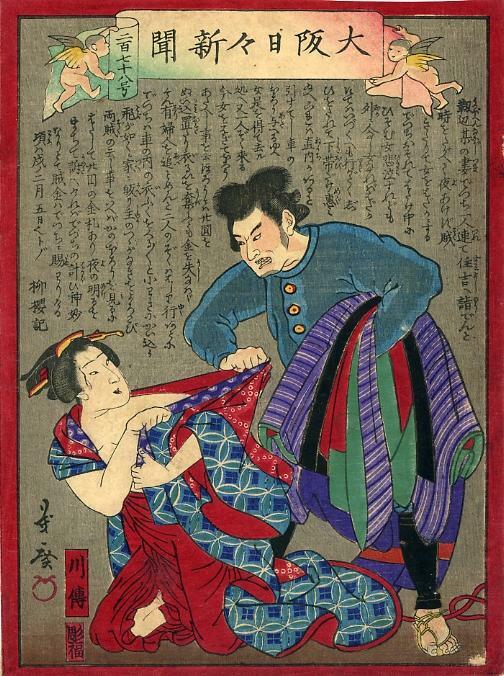 June 28, 1875 -- The Osaka prefectural government promulgates a slander and libel law [ganbo ritsu] , and a newspaper ordinance [shinbunshi jorei], to control speech. As a consequence, the actual names of the ten publishers of Osaka news nishikie are publically recorded for the first time. 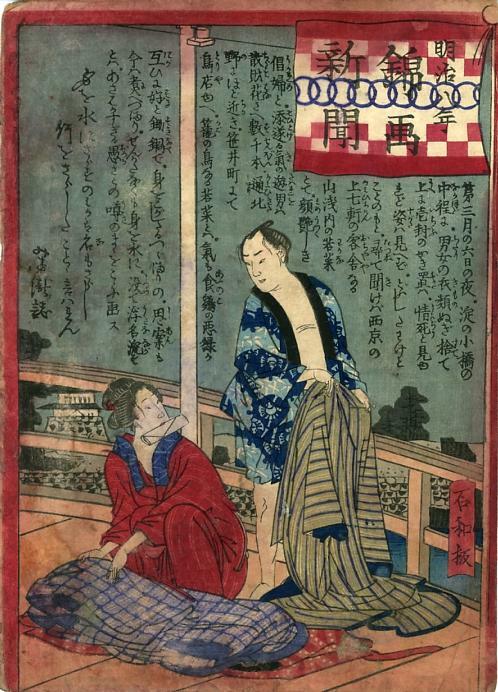 Hara (and Tsuchiya) have collated this information with the content of the 1929 memoirs of Sadanobu II (1848-1940), who drew the vast majority of the Osaka prints and worked with all the publishers. 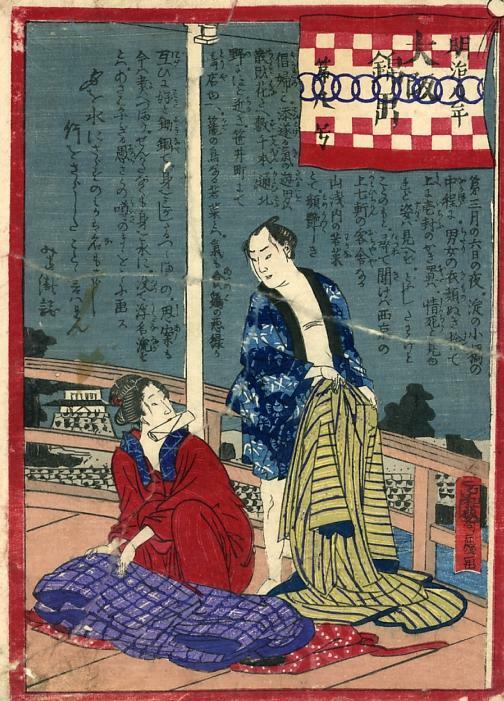 July 20, 1875 -- Ishiwa (Ishikawa Wasuke) is served a complaint from the Osaka prefectural government that he used its symbol without its permission. The government claimed that the design of the flag cartouche of No. 13 in the Osaka nishikiga shinbun series (Series 1) resembled the design of Osaka prefecture's flag. Ishiwa claimed the resemblance was merely an oversight of the designer. 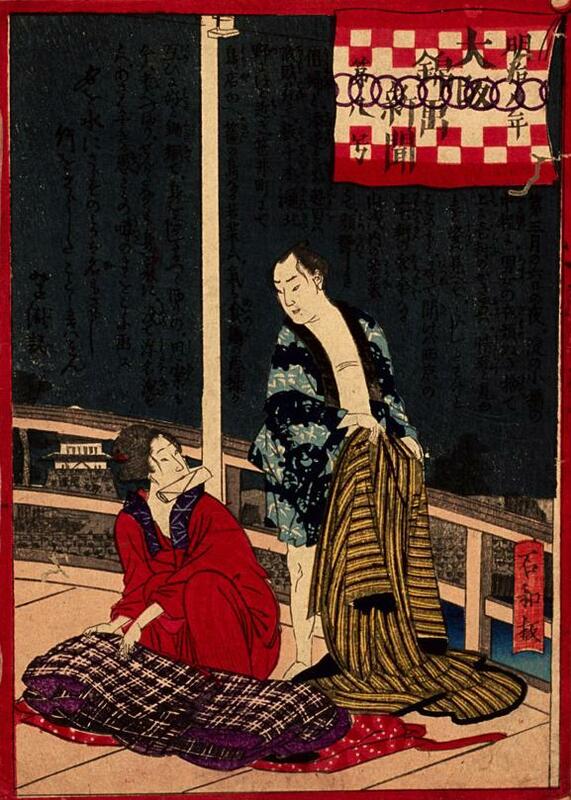 Another problem emerged in that the story on the Ishiwa print was a condensation of the story featured on No. 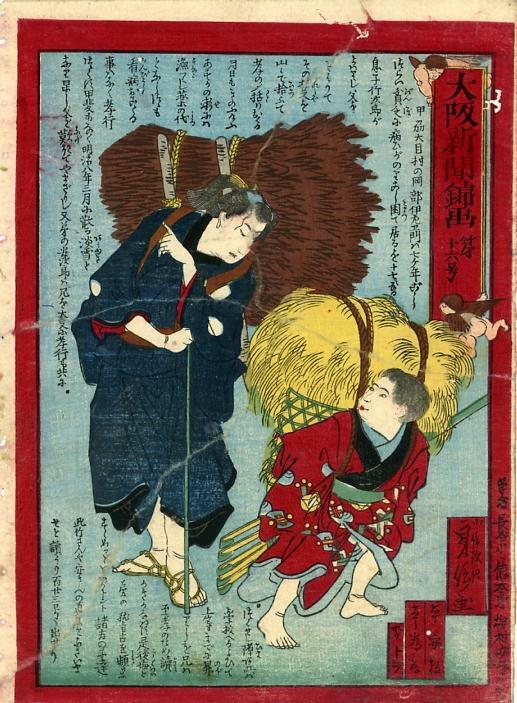 944 of the Tokyo nichinichi shinbun nishikie series. 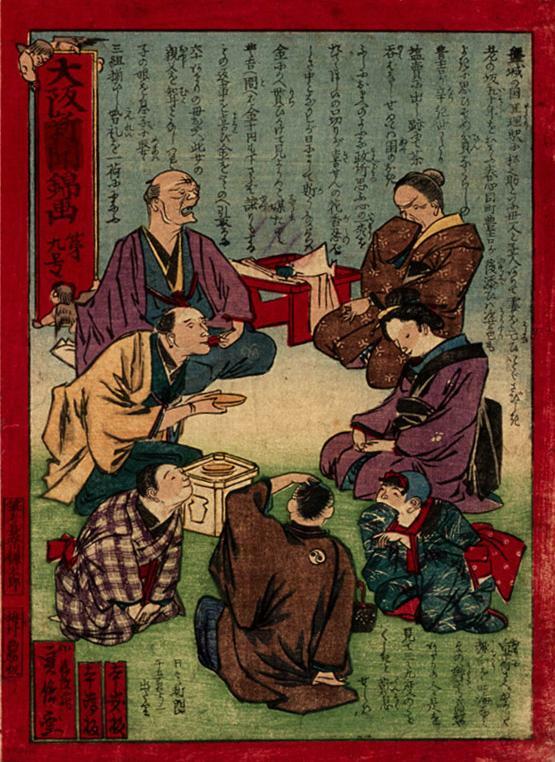 August 8, 1875 -- A notice is circulated by the Osaka government requiring the names of the publishers and the editors of news nishikie, and the names of the newspapers from which they took their stories, to be clearly shown on new and old prints alike. 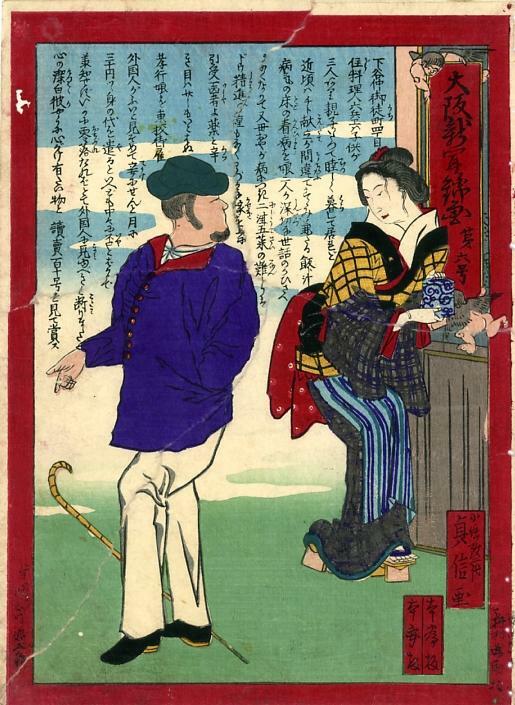 August 20, 1875 -- The Gakumuka [Educational Affairs Section] of the [Osaka prefectural government?] orders the implementation of a five-article regulation, requiring in part that publishers submit three copies of applications when applying to the Naimusho [Ministry of Home (Interior) Affairs] for permission to publish, and change numbers [on prints? that are covered?] in future applications [?]. August 27, 1875 -- A memorandum is handed out, and additionally guidance is provided to ezoshiya [picture book and print publishers and sellers]. With this the incident provoked by Ishiwa seems to have been settled. 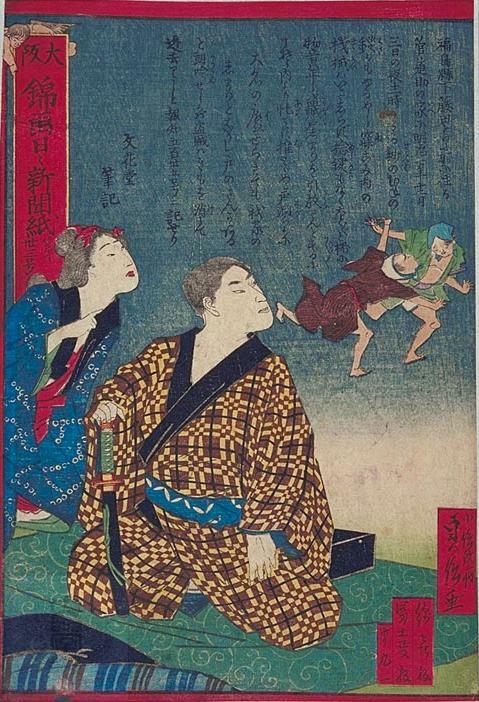 As a result of the above crackdown, Osaka news nishikie publishers had to disclose their own names, and the names of writers, on their prints. Apparently some also had to suppress the word "shinbun" from the titles of their prints, and even from the names of the "news bureaus" within their companies. 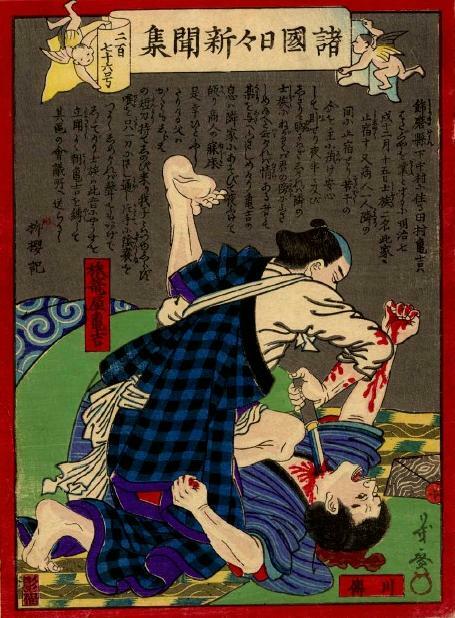 Since disclosure stamps are found on practically all prints from which "shinbun" has been suppressed, we will first look at some examples of disclosure stamps, and then turn our attention to methods of "shinbun" suppression. Stamps were used to dislose (1) the name of the writer and/or editor responsible for the story on the print, and (2) the name if not also the address of the publisher responsible for producing the print. Disclosure stamps varied with publisher. Most publishers favored separate stamps, though a few used integrated stamps. Stamps were either "open" or "boxed" (definitions and specific examples are shown in table following this introduction). They could also be used to suppress "shinbun" at the same time they disclosed publication paraticulars (see discussion of "shinbun" suppression). Here are examples of typical writer and publisher stamps. Both are from the Nichinichi shinbun (Series 9), several of which are shown in the discussion of "shinbun" suppression. 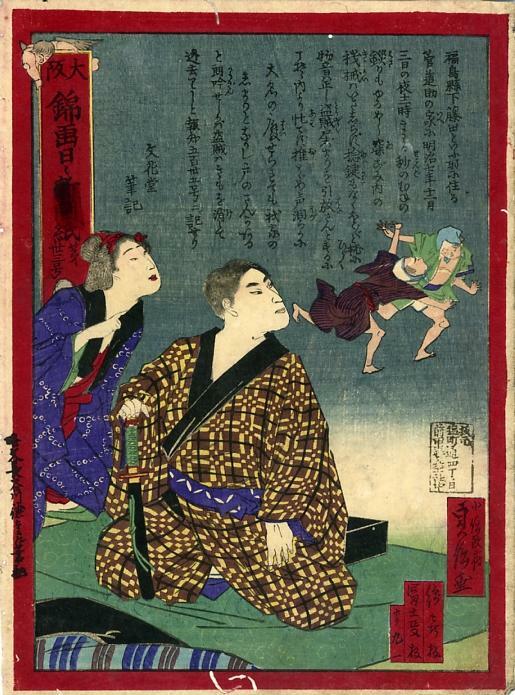 An open stamp on the vermillion border states in a single line "Ryakubun Hasegawa Tokutaro hitsuroku" [tentative reading] -- meaning "Abridgment [of the story on the print] written by Hasegawa Tokutaro". 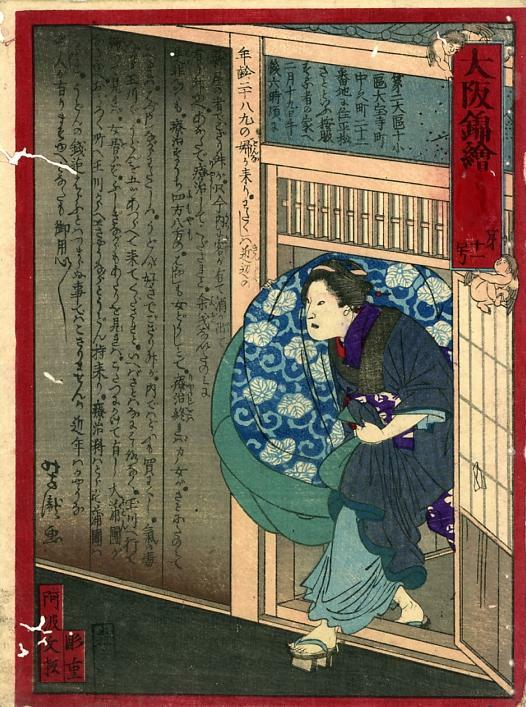 This is the real name of Sadanobu II, who is credited as the drawer in the drawer's cartouche on the print. 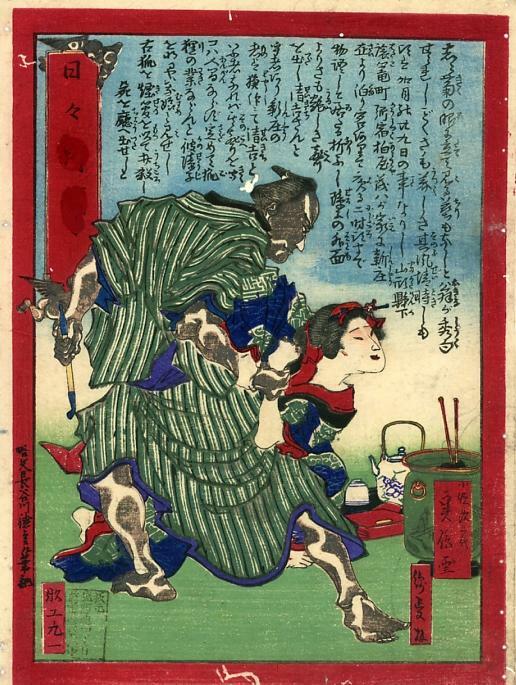 However, Hasegawa also wrote the stories on most of the prints, signing them with a variety of pen names, like "Hanagen" and "Daisuido Risho" among many others. The dislosure of his name here is as the writer, not the drawer. 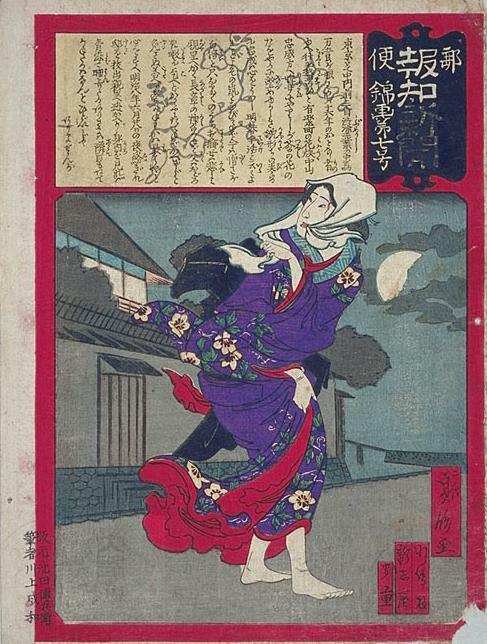 A boxed stamp on the image area of the print states in three lines "Hanmoto / Shiochodori 4-chome / Maeda [other graphs illegible]" -- which discloses the address, and then the name(s), of the publisher(s) (hanmoto). 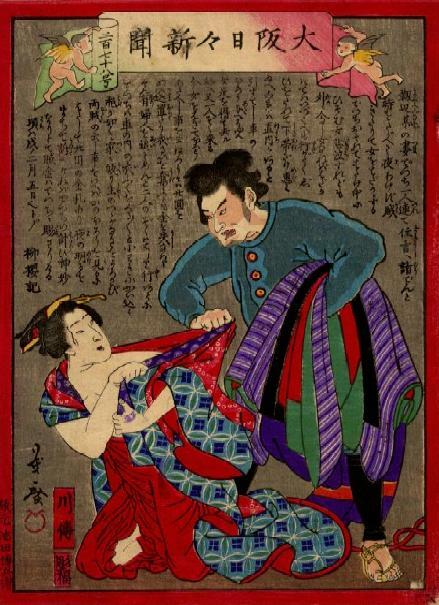 The publisher's cartouche reads "Watamasa", presumably a combination of "Wataki" (Maeda Kibee) and "Fujimasa" (Fuji Masashichi), who co-published this series and others. The following table shows some examples of disclosure stamps on prints that have not been subjected to "shinbun" suppression. 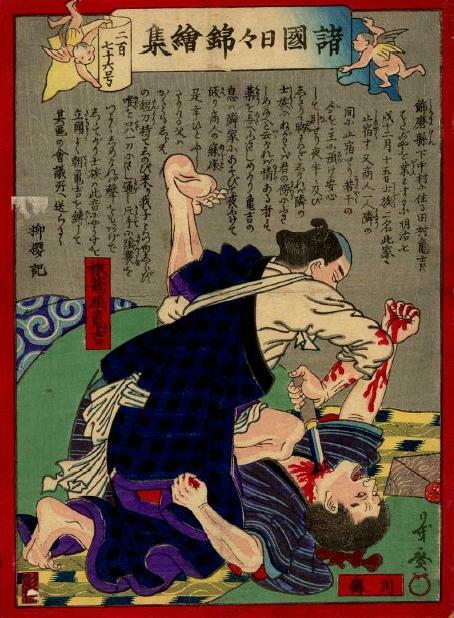 Many more examples of such stamps are shown under the discussion of "shinbun" suppression. Stamps were used to comply with regulations that required the disclosure of the names of writers, and the names if not also the addresses of publishers, on Osaka news nishikie that lacked such information. Apparently such stamps were impressed on prints in inventories that had already been produced from blocks carved with conventional cartouches showing only the handles of the artisans. Disclosure stamps were impressed on borders and/or margins, and on the image area, sometimes near the cartouche of the handle that was being clarified with an actual name. While the following examples show "open" or "closed" stamps used exclusively, one or the other, some publishers used both stamp designs on the same print. Open stamps consist of graphs without a box around them. They are typically impressed on the border and, when straight, may appear as though they had been carved on a block and impressed when the print was produced. But almost certainly they were later overprinted with stamps. "Hontame han" / "Honyasu han"
Boxed stamps consist of graphs enclosed in a box. They are typically impressed either on a clear area of the print where they can be easily read, or on the the margin but often overlapping the border. They are usually carved more finely than open stamps, and the impressions may be weak or uneven, skewed, or even inverted. 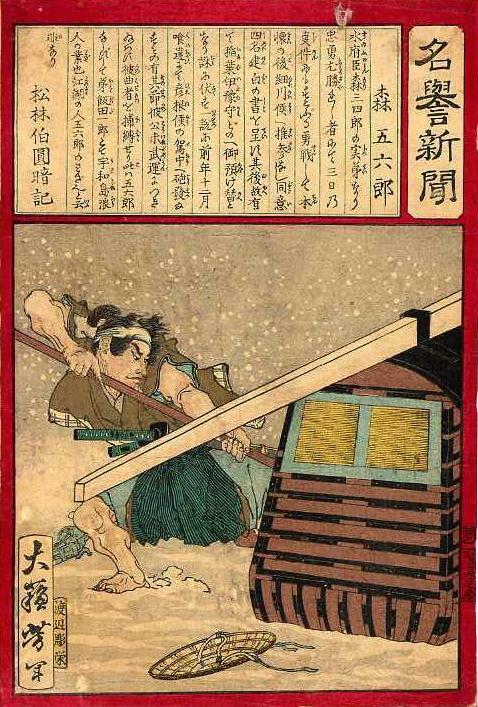 "Shinchodori 1-chome / Yao Zenbee han"
I will now define and give examples of the specific methods of "shinbun" suppression that seem to have affected issues of older Osaka nishikie series with "shinbun" in their titles. Presumably "shinbun" was suppressed after formal regulations or informal agreements decreed that such nishikie could no longer present themselves as "shinbun" -- in the same way that margarine makers have not been allowed to call their product "butter" (though descriptions like "artificial butter" and "butter substitute" have been permitted). Presumably, also, "shinbun" was suppressed on copies of prints that had already been published, as well as on reprints later made from the same blocks. printed and were waiting to be sold from publisher inventories, and as well as on copies later printed from old blocks, sometimes modifying the blocks to replace or remove parts or all of "shinbun", sometimes altering or entirely deleting "shinbun" after printing. Stamps also used to suppress "shinbun"
Stamps were sometimes impressed directly over graphs that were meant to be obscured -- as when "Ishiwa han" was stamped over the "shinbun" of "Shinbunkyoku" on later editions of some prints in the Osaka nishiga shinbun series (See Five variations of ONgS-8 above). 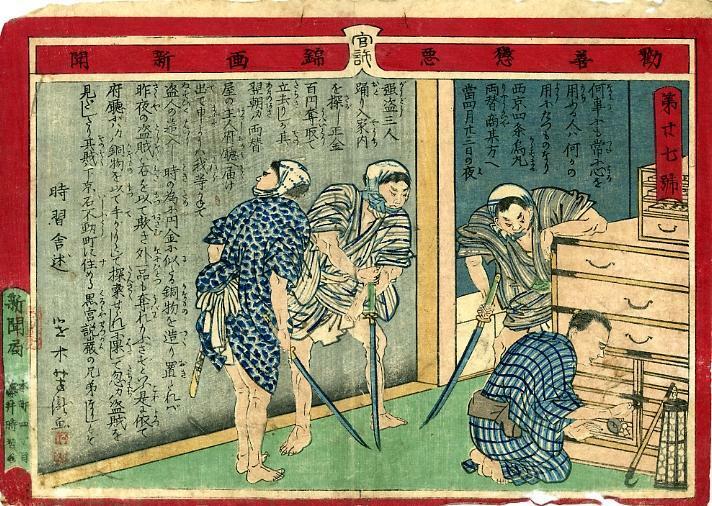 In other cases, the graphs to be obscured were first brushed over with pigment to provide a clear ground for the stamp -- as when "zu" and "kai" and "Shuppanjo" were stamped over "shin" and "bun" and "Shinbunkyoku" on issues of Kanzen choaku nishikiga shinbun after the title was changed to Kanzen choaku nishikiga zukai (see KCNgS/Z above). 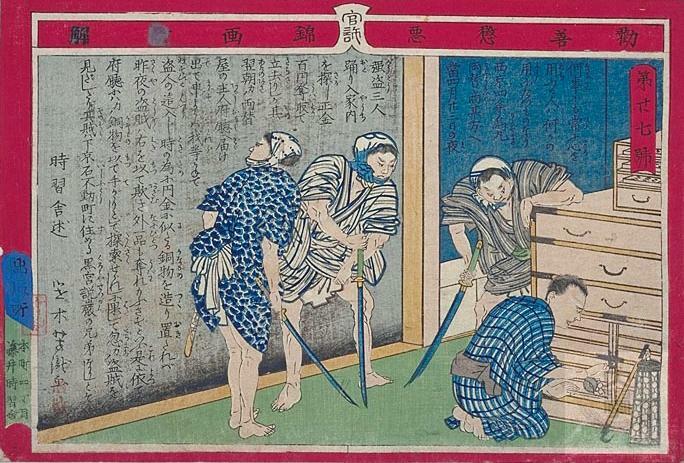 Methods of suppression of "shinbun" varied from inserting new graphs on the block to smearing out while the pigment was still wet. Replacing "shinbun" or even just "bun" on the block produced the neatest and least conspicuous results when carefully done. Alterations by other methods, even when done neatly, were more noticeable, and when not done carefully were outright unsightly. "shinbun" replaced with "zukai" or "nishikie"
DB = "dan" replaced by "bun"
Practically all prints with evidence of "shinbun" suppression also bear the impressions of stamps which disclose the actual names of the writers/drawers and publishers, as required by prefectural regulations. However, as we have seen in the introduction to disclosure stamps, such stamps also appear on prints that have not been subjected to "shinbun" suppression. Perhaps disclosure by over-stamping began sometime before "shinbun" suppression. Or perhaps disclosure was the more unavoidable requirement, while "shinbun" suppression was more discretionary. Disclosure stamps sometimes also served to suppress "shinbun", as when a publisher's stamp was impressed directly over "shinbun" in the publisher's cartouche. 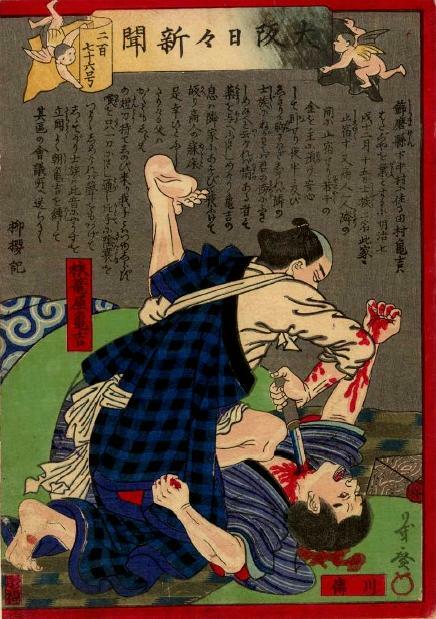 SZ "shinbun" replaced with "zukai"
This method was used on prints of Nos. 1-37 of Kanzen choaku nishikiga shinbun (Series 13) after the title of the series changed to Kanzen choakku nishikiga zukai from No. 38. "Shinbunkyoku" was also replaced by "Shuppanjo" after printing. A "Jishusha" seal at the bottom or at the middle of the publisher's cartouche. See further details below. Series 12 probably represents a case of a later "orphan issue" of Series 1, published as Nishikiga zukai instead of Nishikiga shinbun as reprints of several early Series 1 issues had been renamed from Osaka nishikiga shinbun. SNe "shinbun" replaced with "nishikie"
One example is known in title change of Osaka nichinichi shinbun, first to Shokoku nichinichi shinbun shu, then to Shokoku nichinichi nishikie shu. Further details below. The two examples I have found of this practice are both from Osaka nishikiga shinbun (Series 112). ONgS-8 is particularly interesting because at least five variations of this issue exist, and they can be fairly confidently ranked in order of appearance. Some Osaka nishikiga shinbun (Series 112) have survived in more variations than others. ONgS-8 seems to hold the record at five, all of which are shown below. ONgS-8 was written up in the 18 May 1875 (No. 671) edition of Yubin hochi shinbun. This alone makes it the most remarkable Osaka news nishikie. That there were so many editions may testify to its popularity. and more about the Hochi report. 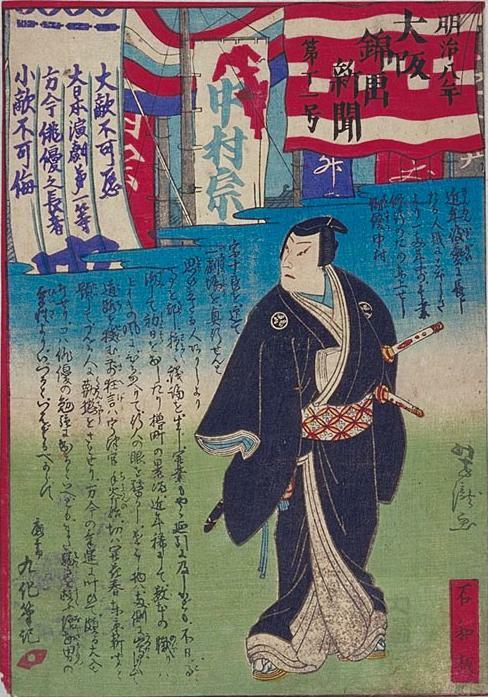 The 1st edition of ONgS-8 is probably the variation whose design most closely fits the description in the Hochi article -- namely, "Meiji-8-nen Osaka nishikiga shinbun Dai-8-go" written on a flag depicting "a series of purple circles on white between red checks top and bottom" of the title cartouche -- and "Ishiwa han" [Ishiwa impression] inscribed on the bottom of the print. The 2nd edition would seem to be the same print without the circles on the flag. The circles represent the "wa" in the name of the publisher, Ishikawa Wasuke, the "Ishiwa" in the publisher's cartouche. 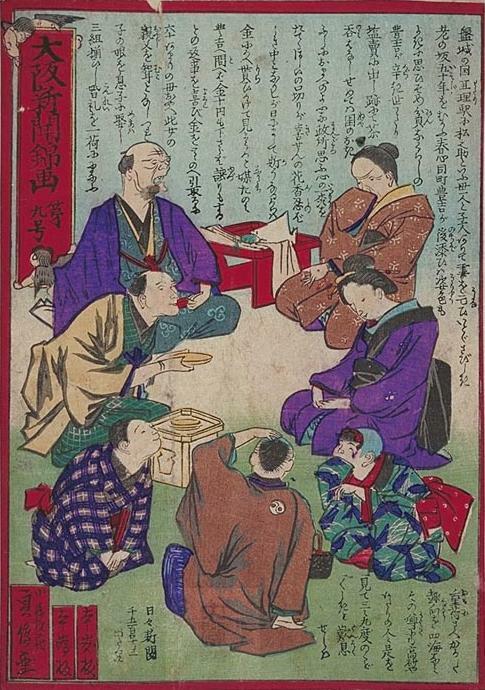 The 3rd edition shows "Shinbunkyoku zoku ga" [News bureau affiliated drawing] in place of "Ishiwa han" -- apparently an attempt by Ishikawa to suggest the nishikie were publications of a "news" (shinbun) company. The 4th edition shows "shinbun" suppressed in both (1) the title, by cutting "shinbun" off the block or otherwise preventing the "shinbun" from printing), and (2) the publisher's cartouche, by stamping "Ishiwa han" directly over the "Shinbunkyoku". The positioning of the stamp is arguably not accidental. The intent is to dispell the illusion created by "Shinbunkyoku" that the publisher is truly a "bureau" or "office" (kyoku) in the business of reporting "news" (shinbun). The 5th edition would appear to reflect a period of permissiveness in which "shinbun" is allowed so long as "Osaka" is removed from the title, and so long as the publisher does not otherwise pretend to be in the news business. Most of the earlier issues in this series have editions like this. 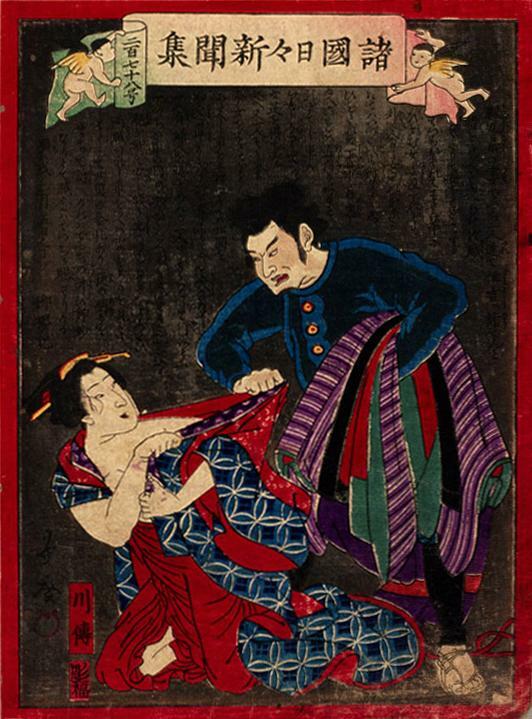 The style of this title informs a single print, drawn by a different artist and published a couple of months later, in which Nishikiga shinbun becomes Nishikiga zukai, which again suppresses "shinbun". The design of this variation is precisely described in the 18 May 1875 (No. 671) edition of Yubin hochi shinbun. Black graphs on vermillion cartouches -- The graphs for "shinbun" -- sometimes together, sometimes shin and bun separately, and sometimes just "bun" -- are brushed out with vermillion pigment. In some cases the pigment is too thin to completely cover the graphs. In some cases the black pigment has mixed with the vermillion pigment, apparently because it was still wet and smeared. In other cases coverage is complete, in others fragments of the graphs remain peripherally. While graphs on black cartouches -- In these cases, some or all of the strokes of the graphs for "shinbun" are brushed over with black pigment. Coverage is usually thin, though in some cases the graphs are totally obliterated. 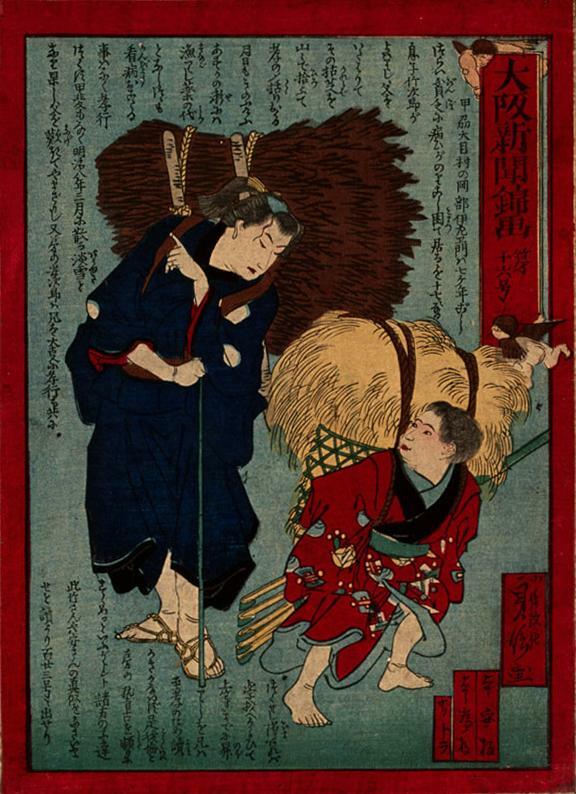 "Honyasu han" and "Hontame han"
"Hanmoto / Shiochodori 4-chome / Maeda [Kibee . . . ?]" WI "wa" inserted in place of "bun"
The main culprit in "shinbun" was "bun" -- and it could easily be replaced by other graphs that, in combination with "shin", also mean something recently heard-told. "wa" was the most obvious choice "wa" meaning something "told" in place of "bun" meaning something "heard". See the final section in this table for an example of "bun" (shinbun) and "dan" (shindan) variation. To replace "bun" with "wa" on the block, the graph for "bun" and enough wood under it is chiselled off the block to permit the inlay of a wooden plug (ireki) on which "wa" is then carved so that "shinbun" became "shinwa". 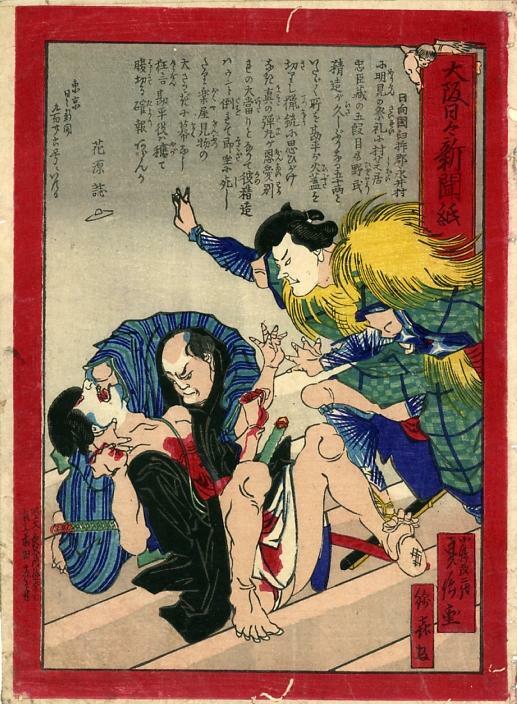 Two examples from what may be the earliest Osaka series -- Series 112 (ONgS) and Series 23 (ONeSw) -- are shown here as likely examples of this method of "shinbun" suppression. See ONgS Variations (112) and ONeSw Variations (23) under Articles for further discussion of these tentative assertions. With "wa" for "bun" but no "30"
WP "wa" pasted over "bun"
A patch of paper with "wa" on it is pasted over "bun". Either (1) the "wa" is printed or brushed on paper colored with vermillion pigment before pasting, or (2) the patch was colored and the graph brushed after pasting, or (3) some combination of these two methods were employed. With "wa" patch over "bun"
That "bun" was the real culprit is clear from the following rare example of brushing out only this graph. 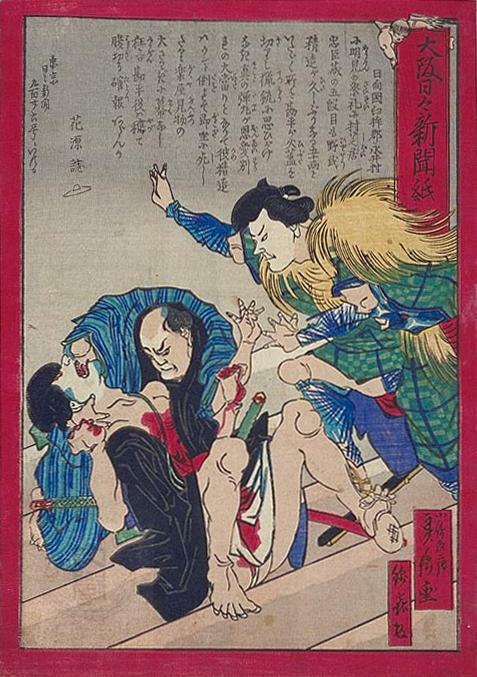 "Meiyo shinbun" becomes "Meiyo shindan"
Cases of "shinbun suppression" as such are not known on Tokyo prints. However, there is a very interesting example of how -- if not exactly "suppressed" -- "bun" was replaced by "dan" in at least one popular series of prints in late 1874. 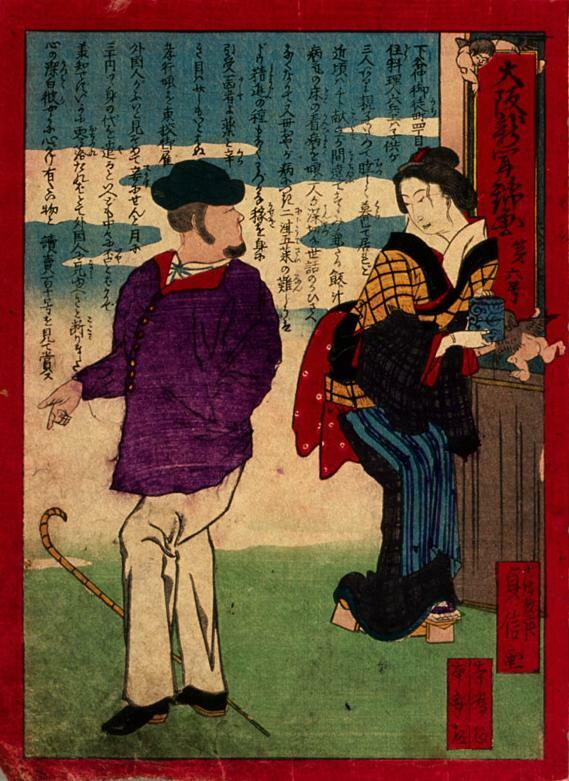 The series, published by Gusokuya, was first called Meiyo shinbun meaning "New tidings of honor and glory" -- then renamed Meiyo shindan or "New stories of honor and glory". Here I will examine only the physical evidence of "bun" replacement by "dan" in this series. 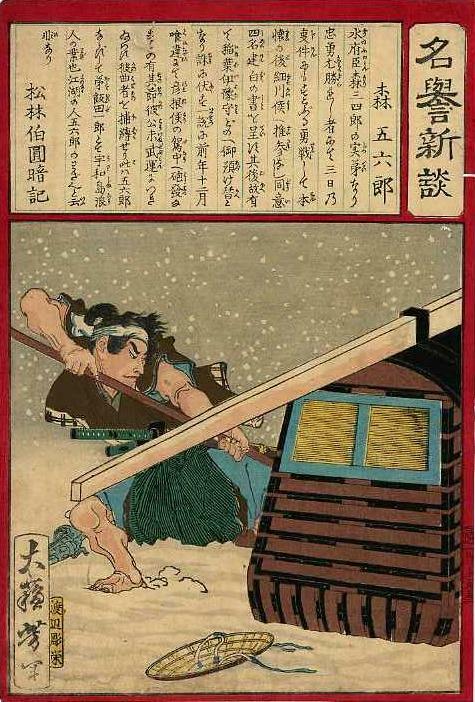 For a general overview of this series -- produced by Gusokuya's "other news team Taiso Yoshitoshi, Shorin Hakuen, and Watanabe Horiei -- see Meiyo shinbun: New tidings of honor and glory. I originally reported here that the "Meiyo shinbun / shindan" case might have been a "man bites dog" inversion of "shinbun" suppression -- for I thought that "shindan" might have been replaced by "shinbun". This conjecture proved to be wrong -- though it is not yet clear that the change from "shinbun" to "shindan" on this series of Tokyo prints took place before the shimbun suppression movement in Osaka. I had not, in 2005, been able to personally examine any Meiyo prints (as I will refer to the series) showing evidence of change either way. The few in my collection were all "shindan" prints that looked as though they had always been that. In 2005, in addition to the few prints in my collection, I had seen only the images of two prints in Machida 1986 (Hajima Collection), two prints in Keyes 1992, four prints on Tsuchiya 2000, and a few prints on websites. Only two of the ten or so prints I was able to see were "shinbun" versions. 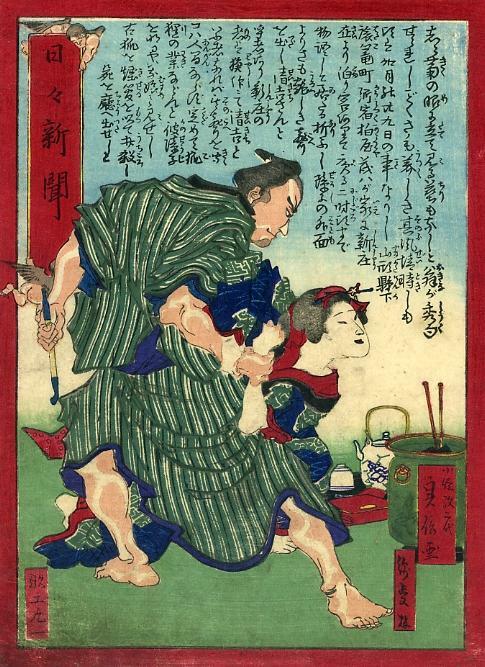 The "bun" on the Takeda Kounsai print shown on Tsuchiya 2000 was fainter than the other three characters, which led me to suspect that it had been printed with a block on which "dan" had been replaced by "bun". I reasoned this could have happened if the surface of the character on the plug of wood inserted into the original block was not quite as high as the surface of the block. I figured Gusokuya had replaced "dan" with "bun" because, as the publisher of the "Tokyo nichinichi shinbun" series, he knew that "shinbun" was more fashionable that "shindan". After putting out the series as "shindan", he reissued a few prints as "shinbun" -- thinking they would sell better that way. Subsequent observations and acquisitions proved that just the opposite had taken place -- namely, "shinbun" was replaced by "shindan" -- in two stages. First a "dan" patch was pasted over the "bun" of already printed "shinbun" editions. 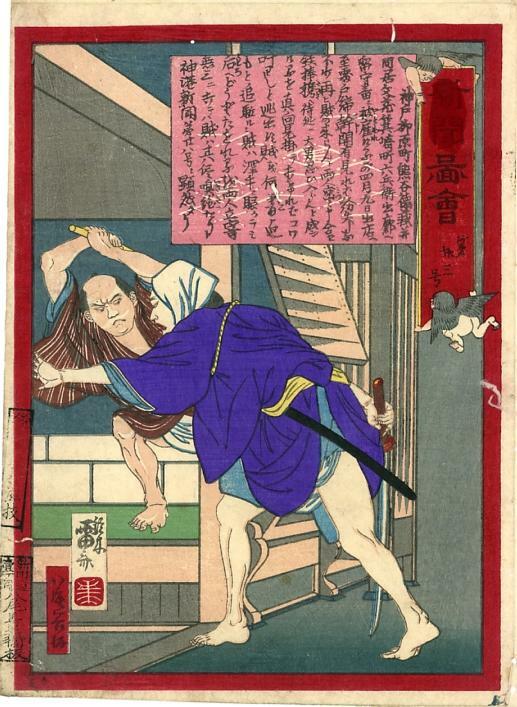 Later editions were printed as "shindan" after replacing the "bun" on the block with a "dan" insert. BD "bun" replaced by "dan"
MS-14 Mori Gorokuro with "shinbun"
Mori Gorokuro with "dan" patch over "bun"